Due to a somewhat comical scheduling mix-up (The Greek in Los Angeles and The Greek in Berkeley are in fact two different places!) 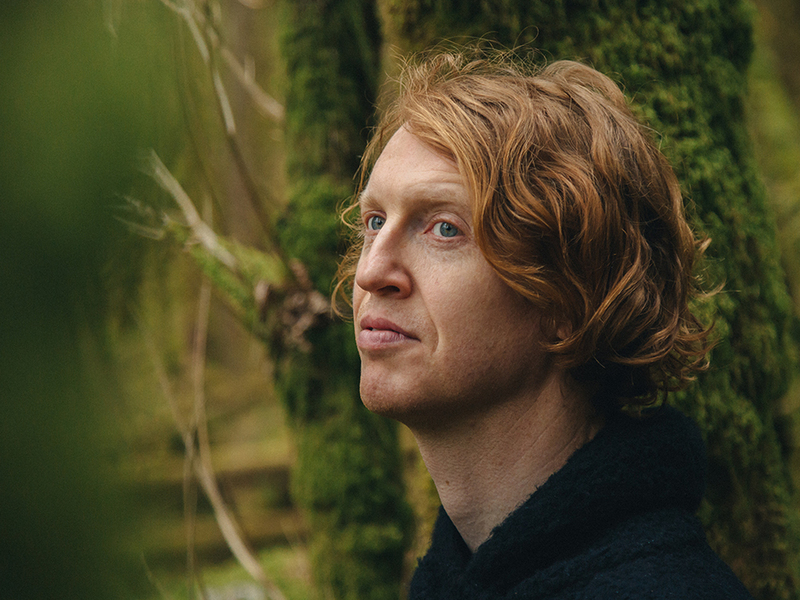 our interview with Arcade Fire’s Richard Reed Parry finally happened after a flurry of phone calls and text messages trying to locate him. When he arrives backstage, he looks like he was just out for a run and that’s because he was. Trying to get some miles in between soundcheck and a marathon two hour performance which probably burned more calories than his jog through the hills of Berkeley, Parry got a call to come backstage to discuss his new album Quiet River of Dust on the same day of its release. After a short chat about his passion for biking (he’s done a huge portion of the west coast) and his penchant for running while on tour, we moved on to the subject at hand which is not the mega-famous band he’s known for but his newly released solo album Quiet River of Dust. This long-gestating solo effort evokes a tranquility inspired by his first trip to Japan over ten years ago. Parry traveled solo through the forests of Japan seeking quietude as a sort of antidote to the sensory overload that comes with a world tour. Traveling anywhere solo is vastly different than a family vacation or getaway with a close friend or spouse. You find yourself in an observational mode able to come and go without an itinerary. You are free to go where your instinct leads you without explanation. This freedom allowed Parry to explore parts of Japan most people would never find on a guided bus tour. I’m not referring to a geographical space but something a bit more abstract. By going it alone one can listen to what is going on around them without interference, and left to his own devices, Parry followed what he described as the “the biggest silence you’ve ever heard.” Going deeper and deeper into the country away from the barrage of Tokyo or Kobe but also away from the tourist magnets of temples and shrines and into Japan’s immaculate forests. While all of this may sound like a whimsical and high minded way to describe an album, one listen will change your mind. Quiet River’s sound has a sublime power unlike any other release you’ve heard this year. Make no mistake, this isn’t musical tourism. While Parry is a multi-instrumentalist there are no Japanese singers or instrumentations to be found. Nothing has been culturally appropriated and there was no direct intention to make a concept record evoking visions of bamboo forests and golden shrines. What happened was entirely organic. In fact this inspiration took almost ten years to manifest itself. During that gestation period, Parry would work on it here and there, mostly in his own home studio away from studio engineers, producers and any pressure from label execs. A crucial factor to this project’s success is that almost no one knew it even existed. Without an impending deadline the album could take shape at its own pace creating something genuine and inspired. The impact of Parry’s trip had such an effect on him that it lingered in the background informing the music without being a direct guide. “It wasn’t that I had a great idea like oh I’m going to write about the forest. It wasn’t that at all. It’s just music that came out of me which for me it turns out is my process. When I came home this music just started falling out of me. It was beautiful. The second time I went I had a small recorder and recorded some of the sounds that are on the record like crickets and cicadas.” The result is an immersive audible record of his journey into a country where nature is still held in high regard alongside technology. “I almost have an aversion to finishing things because I actually like the sense of infinite space and time. This process is akin to drawing in an endless sketchbook as opposed to working on a canvas with the goal of a finished piece. The result is an album with blurry edges and sonic sketches that have room to breathe but somehow avoid sounding like aimless ambient jams even though some of the pieces span almost 10 minutes, an eon in today’s world. During our conversation, we discussed the term “side-projects” and why people feel the need to label solo work as such especially when an artist is in a successful band. Parry clarifies that this not a side project. There is no tier-system to art. “It’s just music that I’m making. I see myself as a broad spectrum musician that needs to balance all of my musical sides that exist. I think I‘d be bored just making rock music and playing rock shows but I wouldn’t be happy just writing compositions. I find myself pulled to balance out whatever I’m doing. If I’m making loud music I need the quiet stuff. It’s not just in music either. In my life, if I find myself traveling I want to just sit still for a while and inversely if I’m in one place too long I want to go on an adventure. That just seems to be how my whole self works,” he laughs. Obviously having the security of being in Arcade Fire affords one the ability to take risks and supports this work but one is no more important than the other in the grand scheme of things in Parry’s view. Much like Brian Eno, who has surprisingly built a career making esoteric music in his solo work and more commercial music in collaboration with Talking Heads, U2 and Coldplay, Parry doesn’t know who the audience will be. “Hopefully it will find the people who need it.” he says. Surely some curious and attentive Arcade Fire fans will seek out this album but hopefully new listeners will be drawn into the album’s quiet embrace as well. Parry enlisted Tchad Blake (Crowded House, Pearl Jam, Arctic Monkeys) to finish up the album. His unique approach to mixing delivered unexpected results that took Parry by surprise. “He did things I would have never thought of but it worked. I asked that the vocals sound like a voice coming from the center of the ocean rather than a voice on top of the sea, pristine and clear,” and Blake was more than happy to oblige. It isn’t often the lead vocalist doesn’t want to be front and center. Parry himself likes recording on the fly and having an engineer that didn’t make him record multiple takes aiming for perfection suited him just fine. In the end this also allowed the music to take shape without being beaten into it. With the album finally out and Arcade Fire’s worldwide trek complete, Parry plans to tour the album but only where it wants to go. He isn’t going to do the predictable major market circuit. Instead he will play the album in a context that he feels it works in. This isn’t an album to tour in clubs and bars. Seeking a new approach he has chosen some more unique locales. One of the first stops is David Lynch’s Festival of Disruption in L.A. After that he hopes to play the British isles and maybe some places he doesn’t get to with Arcade Fire, say some smaller locations in Ireland and finally Japan where he hopes the music will find a natural audience. But wait! There’s more! Quiet River of Dust is just the first of two records. In the spring Parry will release a companion album Quiet River of Dust Vol. 2 consisting of songs related to the same world as the first album. Think of it as a staggered double album. While very similar, there is a slight separation between the two in which Parry uses the metaphor of the mythical river “SAI NO KAWARA” to explain. Listening to Parry explain this, it became obvious that our society and culture don’t have anything to compare this to. If Parry had gone to say New York instead of Japan, a vastly different record would have emerged. Listeners willing to take this journey will be thoroughly rewarded. Like Arcade Fire the music is euphoric but where Arcade Fire offer up the release that all rock music strives for, Parry’s record fills you up. Think of it as a way to recharge when you can’t fit any forest bathing into your schedule. Quiet River of Dust is out now on Anti Records.